The notochordal process is a mesodermal hollow tube structure that extends from the primitive node. Beginning at the cranial midline, the tube elongates, as primitive node cells migrate to the proximal end of the tube. Notochordal process elongation parallels regression of the primitive streak. On day 20 of human development, notochordal process formation is complete. 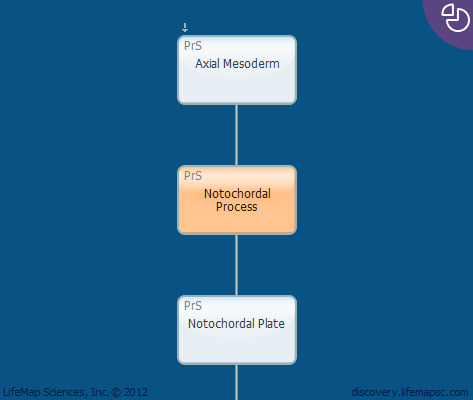 Later morphological changes convert the notochordal process to a structure called the notochordal plate.Anterior migration of the notochordal process is prevented by the notochordal plate that remains adherent to the surface ectoderm. The notochordal process develops into the notochord and will be an early representation of the future vertebrae and bony skeleton.